With New Track "The Absent Christmas"
Canadian progressive/power folklore metallers SCYTHIA are launching a holiday contest for fans to win a Yule drinking horn along with hearing their new xmas song "The Absent Christmas". The lyrics are part historical, part mythical plus the epic power metal Christmas track pulls out all the bells and whistles: chimes, choirs, big guitars, and rippin' solos. "The Absent Christmas" is now streaming HERE. This is SCYTHIA's second holiday track, previously releasing 2012's "...Of Santa". 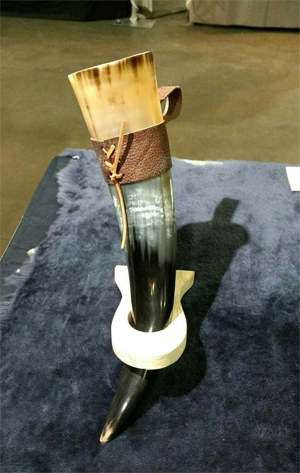 To enter the contest, the only thing fans have to do is name the 3 Christmas songs that are hidden in "The Absent Christmas" and win a killer drinking horn! (pic below). Answers can be emailed to SCYTHIA HERE or Facebook Message via their Facebook page HERE. SCYTHIA will announce the winner on their Facebook page on Friday December 16th at 12 pm MST. Contest is open world-wide, SCYTHIA will cover shipping costs. The band's latest full-length offering, Lineage is now available on iTunes, CD Baby and the band's Bandcamp page.